Portrait of Wallace from his autobiography My Life, Vol. 1 (Chapman and Hall, London, 1905). Copyright © Royal Society. 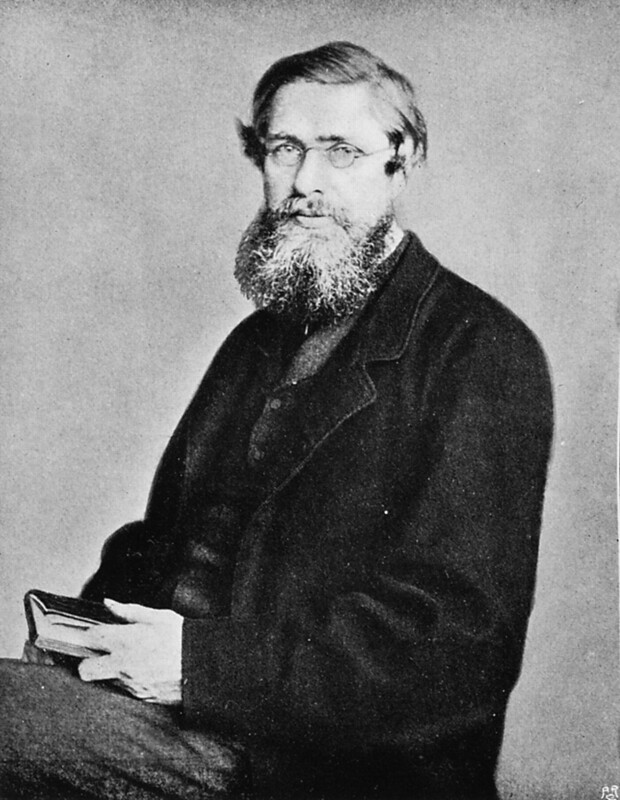 Alfred Russel Wallace often gets second billing compared to Charles Darwin but in a paper recently accepted at Systematic Biology, Tagliacollo et al. define a new term for their analyses (dispersal rate, D) and measure D in units of ‘wallaces‘ (wa) to honor the contributions of Alfred Russel Wallace to the field of biogeography. This detail is a small part of a great paper that tests alternative hypotheses about how freshwater fish assemblages formed in Central America and the Greater Antilles (Cuba, Hispaniola, Puerto Rico, Jamaica, and the Cayman Islands). The authors used parametric biogeographic methods to estimate rates of coordinated dispersal in the two most species clades of freshwater fish in the Caribbean basin- the heroine cichlids and poeciliine live-bearers. Parametric biogeography is a growing field at the intersection of historical biogeography and macroevolution. Its aim is to model the history of range evolutions within a phylogenetic and spatial framework (see Ree & Sanmartín 2009 and Sanmartín 2010). iii) comparing observed and expected dispersal rate values to identify the relative contributions of these paleogeographic agencies. [the modified program, called LAGRANGE+] differs from the original LAGRANGE program in treating each dispersal rate parameter in the dispersal matrix as a separate value to be estimated. The dispersal scalar is removed from the process, and the dispersal matrix is then interpreted as a set of absolute (not relative) dispersal rates. The models of area connectivity through time (Fig. 1, center panel) employ eight independent dispersal rate parameters among five geographic areas and three time intervals. Tagliacollo et al. 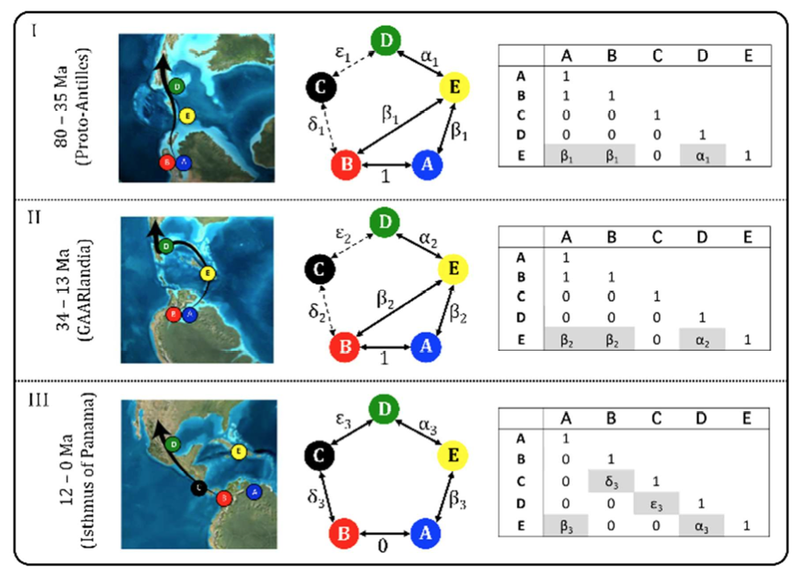 developed a dynamic model of Caribbean Plate evolution and estimated Do between five geographic areas (labeled A-E in Fig.1) over three time intervals (I-III in Fig. 1). Expected dispersal rates (De) were generated from nine alternative paleogeographic models with three parameters- dispersal rates were i) proportional to target area, ii) inversely proportional to distance, and iii) proportional to the volume of freshwater discharge from nearby rivers (for example, the Proto-Orinoco-Amazon River). Results! The LAGRANGE+ analyses found a persistent dispersal corridor along the eastern edge of the Caribbean Plate during the Paleogene (66-23 million years ago) with the earliest dispersal of heroine and poeciliine fishes to the Antilles ranging from 48.9-42.6 million years ago and 59.6-49.5 million years ago, respectively. Phylogenetic and biogeographic data reviewed here suggest the Pleistocene Isthmian exchange was of limited taxonomic scope for freshwater fishes, bidirectional, with taxa moving in both directions, and asymmetrical, with a preponderance of taxa moving south into the Pacific slope of Colombia (Chakrabarty and Albert 2011). The rise of the Isthmus is best viewed as the most recent of many geological and geographic events involved in the formation of the modern Central American and trans-Andean ichthyofaunas. The Isthmus is only one piece of a richly complex puzzle that is the biogeographic history of this region. This entry was posted in methods, phylogenetics, phylogeography, Uncategorized. Bookmark the permalink.